Dip your toes into this clear blue infinity pool at the resort and feel your worries FADING AWAY. L’Heritage’s Infinity Pool is designed with the latest E-clear Crystal Water Technology to provide you with a chlorine and chemical free pool experience. E-clear generates no harmful chloramines gas or toxins providing a guaranteed superior swimming experience without any red eyes, allergies and asthma. 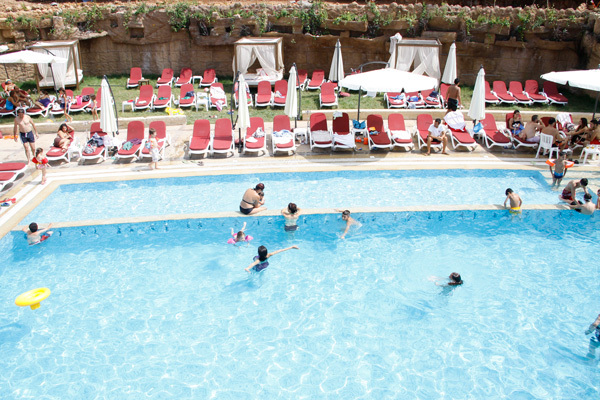 The water is heated to the perfect temperature so you and your family can enjoy swimming day and night and even in May and September. Relax by the amazing pool during the day or at night. Enjoy our five star deluxe service by the pool and enjoy your drinks and food. You can have a drink in the pool while enjoying the panoramic view of Beirut at night.